I moved to Chaska a little over a year ago. Today I decided to find my new state representatives online. My state House member is Joe Hoppe and my state Senator is Scott Jensen. Both are Republicans. I’m not. I have plenty of Republican friends, even very conservative Republican friends with whom I can debate and disagree with agreeably. I enjoy my discussions with them because they challenge my beliefs as much as I challenge theirs. I am the richer for it; I better understand where they’re coming from as a result. So, today I was hoping to learn more about the people who have been elected to represent me at the state capitol in our beautiful state. Left lane squatters are the scourge of society. Since it was posted yesterday, January 21, the day of the massive Women’s Marches across the country, I naturally assumed he was referring to those very marches. I was curious as to why he would call them “mean,” which I didn’t see in the coverage. I thought it was all about Americans asserting their constitutional rights. I was going to reply to find out exactly what he meant by that but then noticed that someone else had already replied, so I clicked to investigate. As you can see from the above screenshot, that person was state Senator Danny Schoen, asking if he was referring to the Women’s March. 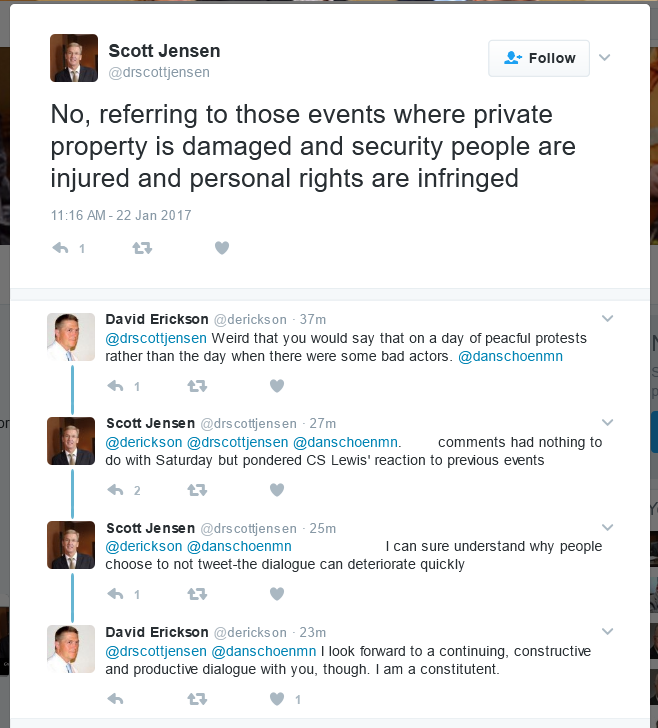 Senator Jensen responded to Senator Schoen by saying: “No, referring to those events where private property is damaged and security people are injured and personal rights are infringed,” which happened the day before, Inauguration Day. So, naturally, I wanted to point out the obvious by saying it was weird, then, that he would make such a statement on the day of the Women’s March rather than the day before, when there was actually some property damage by protesters. I thought it was a pretty mild comment and gave him a chance to further clarify or respond. @drscottjensen @danschoenmn I take you at your word, then. 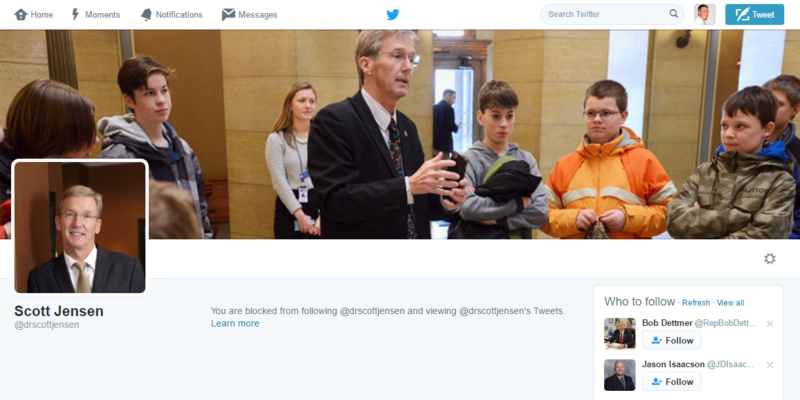 @drscottjensen @danschoenmn I look forward to a continuing, constructive and productive dialogue with you, though. I am a constitutent. I thought my exchange with the Senator, while mildly challenging him, was respectful and I tried to demonstrate my openness to discussion. Which is why I was stunned to subsequently find he had blocked me from his Twitter account. Needless to say, I am very disappointed in my State Senator’s decision to ignore the voice of one of his constituents. The funny thing is, it’s not like I can’t follow his tweets anyway. All I had to do to get the screenshots of his tweets for this post was log out of my Twitter account and go back to his. This Summer’s Basilica Block Party takes place on Friday, July 10 and Saturday, July 11. You can buy tickets online here. The Basilica Block Party started in 1995 as a fundraiser to pay for the restoration of The Basilica of Saint Mary. Today, proceeds from the party benefit The Basilica Landmark, which restores and preserves the historic Basilica. A portion of the proceeds from the Block Party also go to The Basilica’s St. Vincent de Paul outreach program, which provides services to those in need. The prominent names who have performed at the Block Party over the years is pretty remarkable. The food at Macy’s Sky Room is wonderful but the service is sometimes a bit iffy. Two lynx face off in Northeastern Minnesota, near Sawbill Lake.